With the success of their major label debut, New Wave, as well as endless acclaim from both critics and fans alike, AGAINST ME! have quickly ascended to the upper echelon of the punk scene. A pivotal step along the path that led to their current enviable status was the 2003 release of As The Eternal Cowboy. 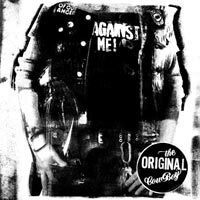 A ground breaking album that effortlessly blends the intimacy and passion of AGAINST ME’s live show with their heartfelt and jarring music, As The Eternal Cowboy served as a defibrillator for a then stagnate music scene. Recently, to the delight of their faithful following, the band elected to release the predominantly never-before-heard demos from the album under the title The Original Cowboy. AGAINST ME’s singer/guitarist Tom Gabel had this to say about the release: “Recorded and mixed in only a couple of hours, The Original Cowboy was only meant to be a trial run, but, listening to it today, there’s a part of me that feels foolish for ever recording these songs a second time.” Fortunately for their adoring fans, with the release of The Original Cowboy, we get to enjoy this momentous album in its original incarnation and judge for ourselves.